I've never considered myself a mountaineer but like a bit of a challenge when I take a trip abroad. Our first thought having tackled Annapurna base camp in Nepal in 2010 was to climb Mount Kilimanjaro but everyone I'd spoken to who had done this climb said they had not really enjoyed it. Too many people, crowded paths and camps and too many charging up the mountain with altitude sickness. For me the journey is as important as reaching your destination. I wanted to enjoy my trekking experience. 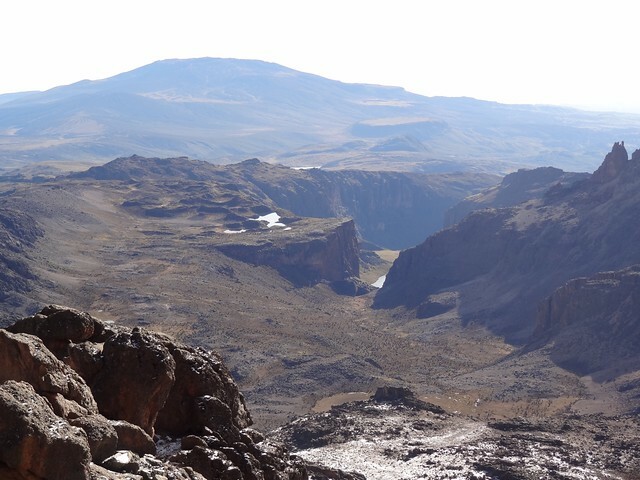 I met Ben from Tourdust at a travel industry event in 2011 and he suggested doing Mount Kenya and thus the idea of an alternative African mountain with lots to see along the way became a reality. I persuaded my American friend Diane to join me and the flights were booked. However we had overlooked the fact that our trip was going to coincide with the Kenyan elections on March 4th 2013. Whilst many of the expats were being shipped out of Nairobi for safety reasons we were flying in. Friends who had lived in Kenya during the last elections shared lurid stories of the violence which had broken out after the last elections in 2007 when more than 1200 people had died and more than half a million lost their homes. We decided to keep to our original plan and take a risk with our trip. Fortunately the elections went peacefully and Uhuru Kenyatta won with only a 0.07% gain over the 50% of the vote necessary to run the country. It took a long five days to issue the results but the delay did not cause any violence and instead Nairobi had one big party to celebrate. The level of voter participation was amazing as more than 85% of the country turned out to vote. I admire this level of participation and interest in the democratic process. The elections proved to be a hot topic of conversation during our trek and we enjoyed discussing the possible outcomes with our guide Francis and our friendly driver Samuel. I was amazed at how engaged and informed everyone was about the election. Our trip started with a stay at the new Eka hotel near Nairobi airport which had a lovely infinity pool, comfy beds, quiet rooms, friendly staff and a great breakfast. We then met our guide and travelled direct to the Mountain Rock Lodge for the first night of our trek. We had a comfortable ensuite room each and then realised that this was to be a trip without any of the crowds that flock to Kilimanjaro. We had the place to ourselves. During the afternoon our guide Joseph took us on a local hike. 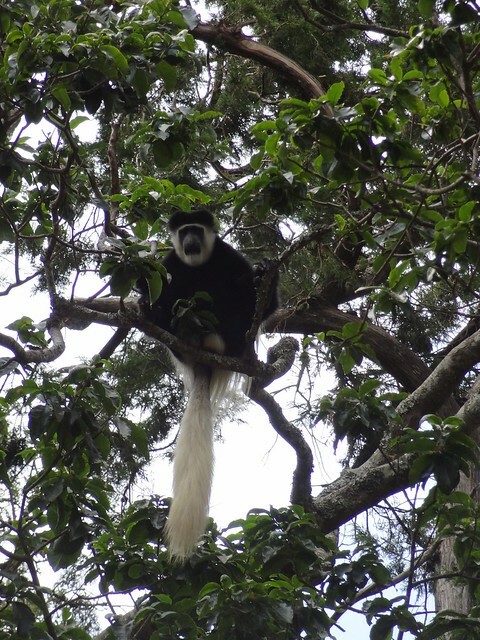 We were lucky enough to see the local colobus monkeys enjoying the fruit in the nearby trees and lots of evidence that elephants had been digging up the soil with their tusks in search of minerals. We also dropped in to meet James, the retired chief of the local village and he chatted to us about life as a Kikuyu farmer in the area. The zealous missionaries who converted much of Africa to Christianity during the early 20th century are largely responsible for the raft of English names that many Kenyans now use. The next morning our really experienced guide Francis introduced us to our cook Ngari and our four porters who took great care of us and our luggage. The lodge had a 3D model of the mountain in the grounds and Francis showed us the route up the mountain. Sadly I did not pay enough close attention to this briefing and was not fully prepared for the terrain that would meet us on Day 4 of our trek to the summit. 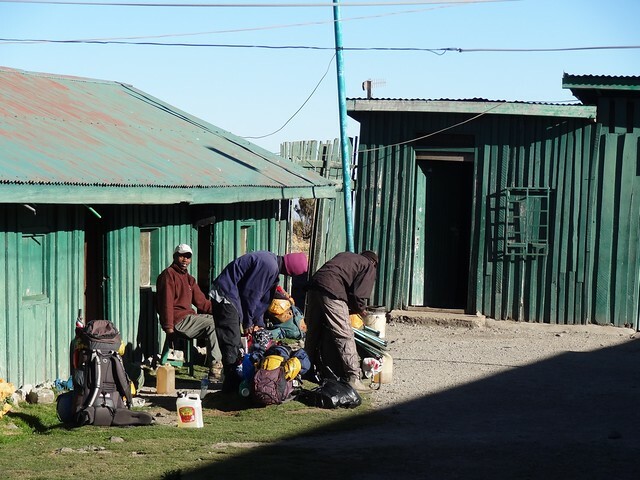 We then took a minibus up to the Sirimon park gates and set off for Old Moses Camp which at 3300m would be the first test of our ability to deal with the altitude. It was a gentle 3 hour ascent crossing the equator and we took it slowly as Francis shared stories about how a couple of Israeli trekkers had set the forest alight a couple of years ago when their stove got out of control and left behind 10,000 acres of burnt forest. 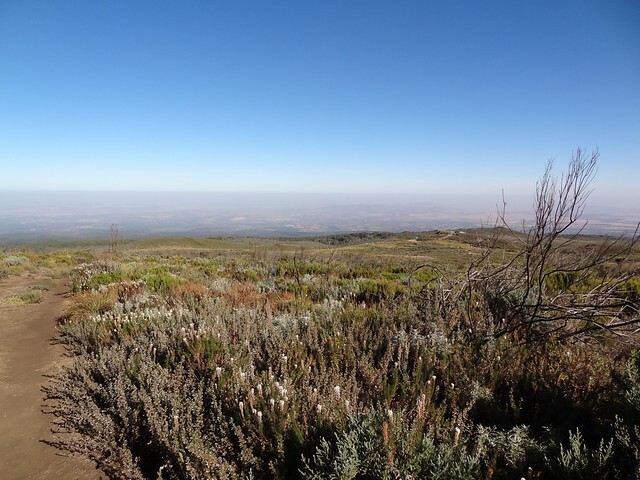 Despite the fire damage we enjoyed some of the most spectacular and colourful mountain scenery I've ever seen during our trek with giant heathers and open moorland . As the sun was starting to set we headed further up the mountain as we remembered that climbing high and sleeping low would enable us to get a better night's sleep. Old Moses camp consists of a couple of basic green huts which ressemble garden sheds. Our cook Ngari delivered a very tasty 3 course dinner from the makeshift kitchen. We shared a small dorm and despite initially overheating in my 4 season bag, designed for arctic conditions, we had a good night's sleep. 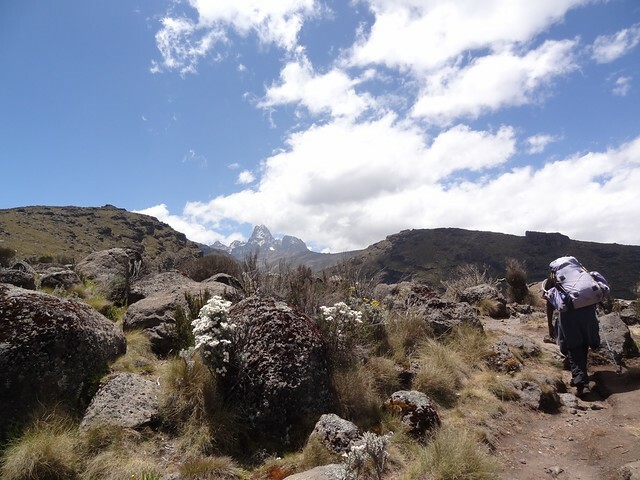 On day two we continued onwards and upwards towards Shipton camp which is a long tiring day and determines who is most likely to make it to the top of Mount Kenya. 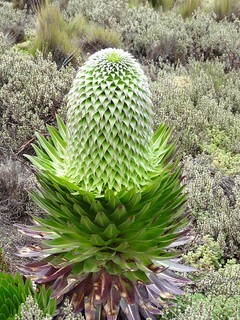 The landscape changes from heathers to strange looking unique silver plants and lobelias that were taller than us and proved to be ideal hiding places for the local hyrax. 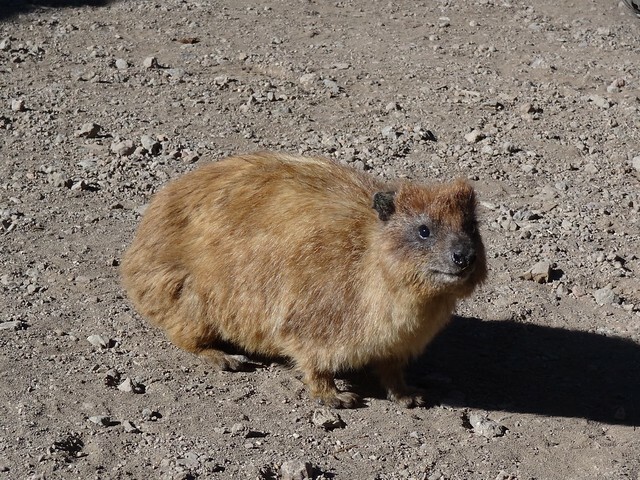 These creatures resemble overgrown guinea pigs and make the loudest racket at night - a bit like a a huge bird in great distress. We paused a few times by idyllic streams and on a couple of mountain passes to enjoy the views and the stillness. This is a real garden of Eden and Francis answered all our many questions about the flora and fauna which are unique to this region. We climbed a ridge where we could look along the whole length of the Mackinder Valley towards Shipton’s Camp – our destination for the next two nights. It was a long 8-9 hour slog to Shipton's and the increase in altitude (almost 1000m) really started to affect me as I reached the camp. I had nausea and a severe headache. I put myself to bed with a cup of Ngari's magic brew of lemon, ginger and garlic tea. I was feeling much better after an hour or so but only managed a bowl of Ngari's tasty leek soup for dinner. The next morning we slowly eased yourself out of our bags into the bitter cold and walked out to enjoy the most amazing sunny view of the snow covered surrounding peaks. Shipton’s camp at 4250m is nestled in as small crater and the stillness and has stunning views down the majestic wide Mackinder Valley carved out by a giant glacier. We were here for a couple of nights to acclimatise and took a scramble up a scree slope to 4600m to enjoy the views of the valleys and Two Tarms below and the peaks of Batian and Nelion. Francis taught us the art of walking quickly down scree slopes which was a vital skill for negotiating the terrain the next day. Summit day finally arrived and started at 2.30am with a hurried cup of tea and biscuit that was needed to sustain us until our next meal at midday. It was absolutely freezing as we set off under the stars. We had received our briefing to minimise the risk of our water pipes freezing up and layered up to stop getting hypothermia. The track quickly became very steep and slippery and we really had to dig our toes into the mountainside to get any traction and heaved ourselves up the mountain one small step at a time. The one thing we decided not to do was to look up at the slopes above us. We just focused on putting one foot in front of the other and kept going. Several times as I hauled myself over the rocks I questioned whether I could do it. Fortunately I’d packed some rehydration packs to put in my water bottle to keep me going. It took us four long hours to get to the top and you’ll notice from the photos that we didn’t quite make it for sunrise but we did make it to the top. The last 200m are the toughest of all as this involves clambering over huge rocks, narrow icy ledges and sheer dropoffs. Anyone with a fear of heights should not attempt this mountain. There are a few cables which I held onto for dear life towards the top to help you to negotaiate the rocks. 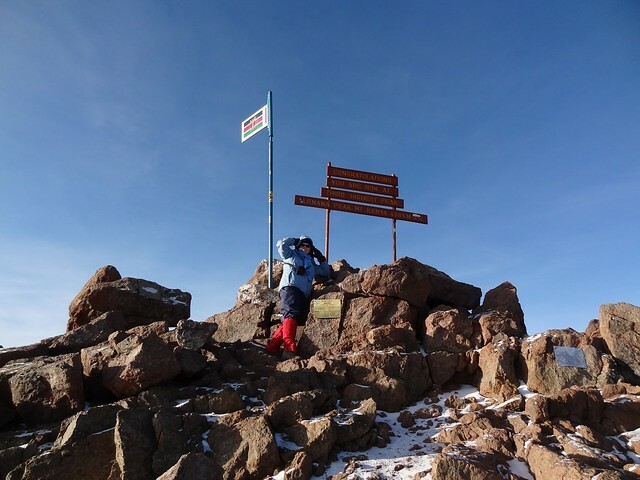 For the final few metres there is a set of vertical iron bar steps to the ledge which marks the top and Lenana point at an altitude of 4985m. 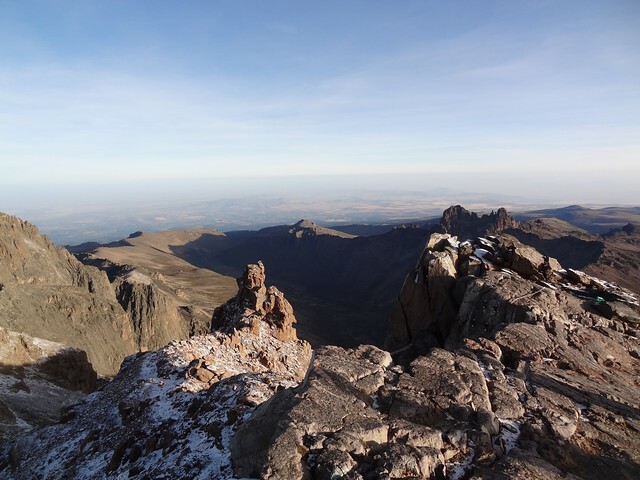 There are 3 ways to climb Mount Kenya but the other two routes Pt. Batian (5199m) and Pt. Nelion (5188m) require a lot of technical mountaineering skills and are even more dangerous. At the top we gave ourselves an emotional hug of congratulations and I just lay on the rocks trying to stay out of the wind before we hauled ourselves to the signpost for the required photo shoot. 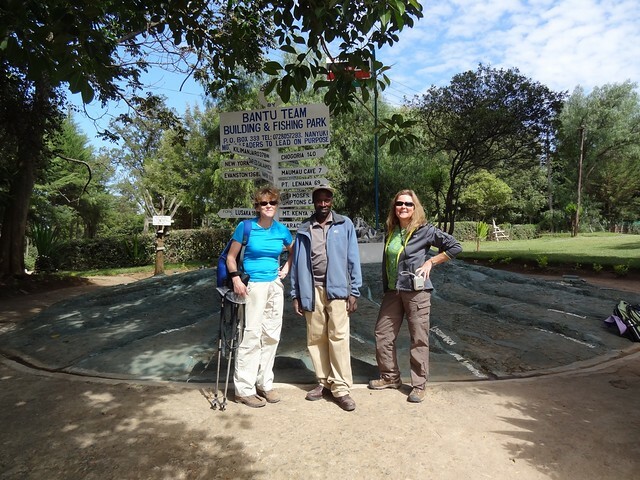 We had made it and now we had the task of getting back down the mountain safely and over the ridge towards Chogoria. We didn’t stay long on the top as it was very cold and windy. Next came the very slippery descent as the path had ice and snow on it. We had to really concentrate on every step so that we did not slip and fall off the ledges or slide on the rough gravel between the rocks. After descending about 200m we had a rest behind the rocks and looked out over the most spectacular Gorges Valley and lake that you can see in this photo. We could also look left over Mackinder Valley. We had to negotiate a lot of rough steep scree to get down into the valley and every few steps you could hear someone slide on the small stones. 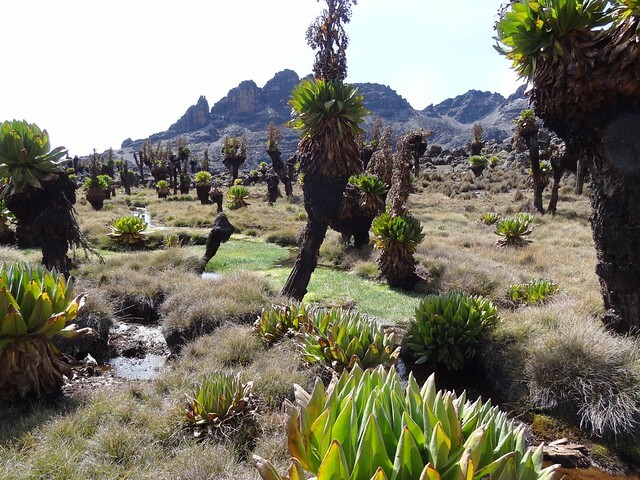 We arrived at some quite boggy land with a few pools glinting in the morning sun and many giant lobelias. 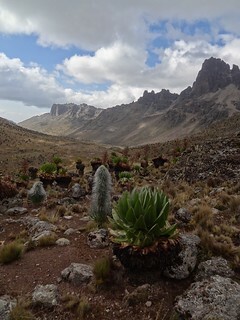 We stopped for for a late breakfast in the sun which had disappeared by noon so we pressed on to Nithi Campsite (3300m). This was a very long tiring walk along a ridge looking down on our right into the spectacular gorge where two aircraft had crashed – one just a week before. Francis was busy trying to spot the helicopter wreckage on the mountainside. 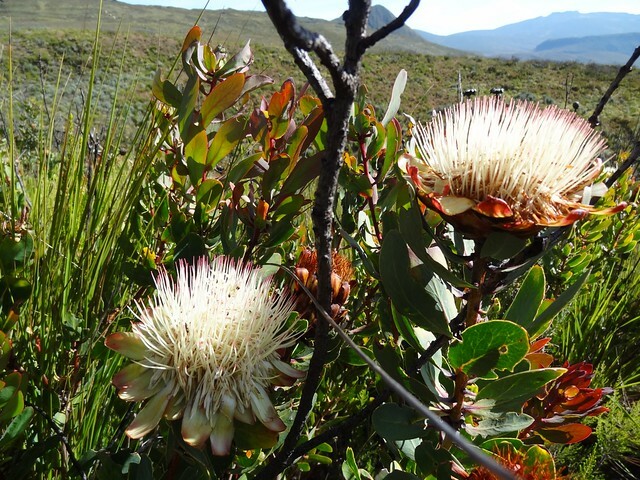 Along the ridge with the amazing views of the table top mountains in the heather zone, we came across the beautiful proteas plants. We came off the ridge and arrived at the Nithi campsite (3300m) at about 4pm and just lay our tired bodies on the grass to recover. Our tent was prepared for us and we enjoyed one of the most peaceful and stunning landscapes of our whole trip before slipping into our sleeping bags around 7pm as this had been one very long and eventful day. 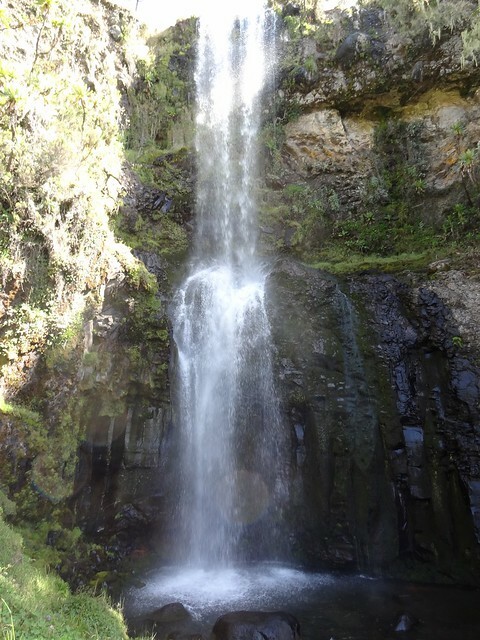 The next morning after breakfast with Ngari’s delicious pancakes and fruit, Francis took us on a short walk and scramble to Nithi Falls which were nestled below the path in a small gorge. We then continued along the dirt road to Bandas camp. It was much warmer and very sunny and we could see the evidence of buffalo and elephant in the area. Fortunately we did not bump into any. 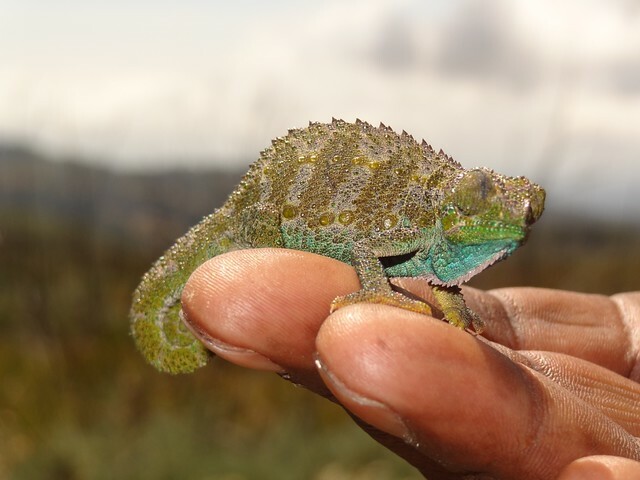 Francis pointed out their tracks plus those of hyena and spotted other local creatures, including a beautiful chameleon as shown. We crossed through a series of shady forest areas which were a great respite from the hot morning sun and admired the table top mountains in the distance. 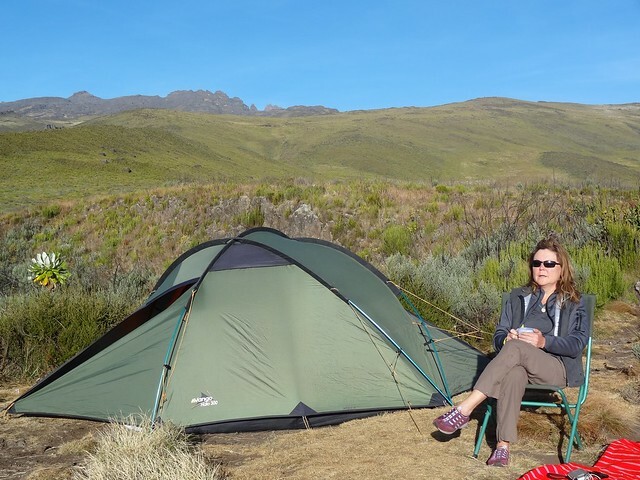 At Meru Bandas camp (3000m) we were allocated a small cottage with sitting room, fireplace and an ensuite room with real beds and bedlinen. A total luxury after a lack of showers for five days. Thank goodness for the invention of wet wipes which prevented us from smelling to high heaven, given our very sweaty adventures. Our final evening was spent enjoying the views from the camp, a short walk in the bamboo forest and a few card games by the roaring fire. Ngari’s wonderful culinary dinner creation magically appeared from his makeshift kitchen for the last time. The last morning as we stepped out through in the early morning sunlight we caught a glimpse of the impala by the local steaming waterhole and admired the huge bamboo forest on either side of the dirt road. 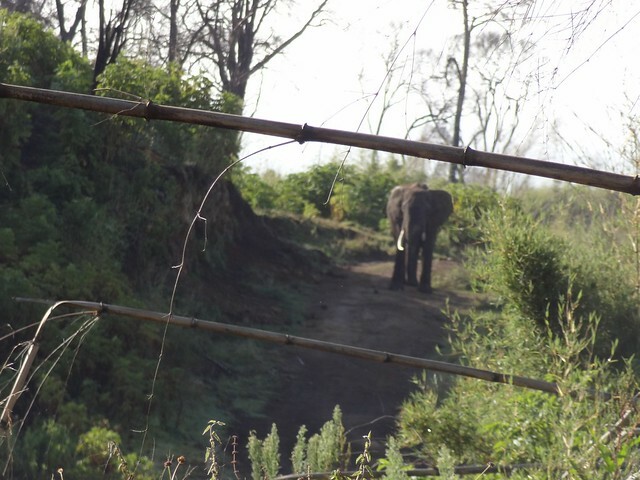 Suddenly we were all advised to stop in our tracks as Ngari had just spotted a single bull elephant on the road ahead. We had to stay put and despite trying to “smoke it out” by lighting up a few cigarettes, it stayed near the road and we were unable to pass it. In the end Francis phoned our driver Samuel who had to make the long drive up the rutted road to rescue us. 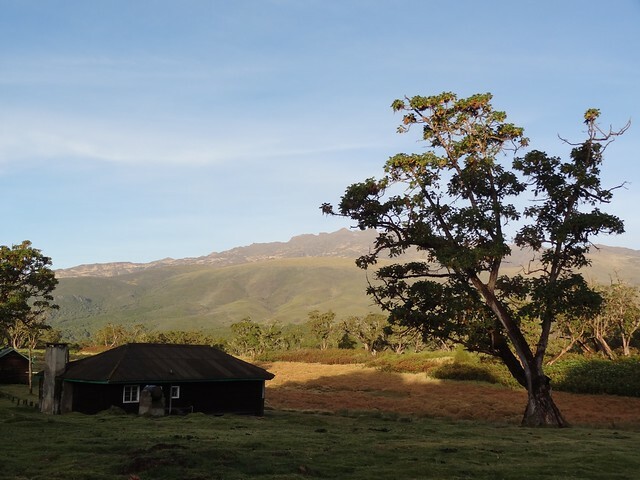 Our Mount Kenya peaceful and memorable adventures were over and it was time to make the long drive around the mountain to our safari lodge at Sweetwaters for a couple of nights. 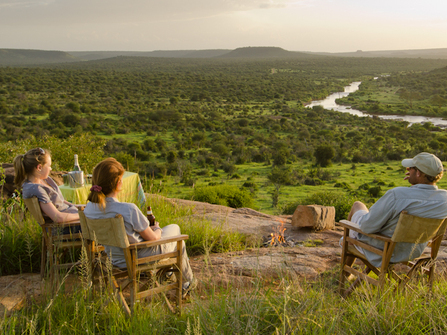 As there were few tourists we were treated to a luxury tent right next to the waterhole where we could enjoy watching the animals. 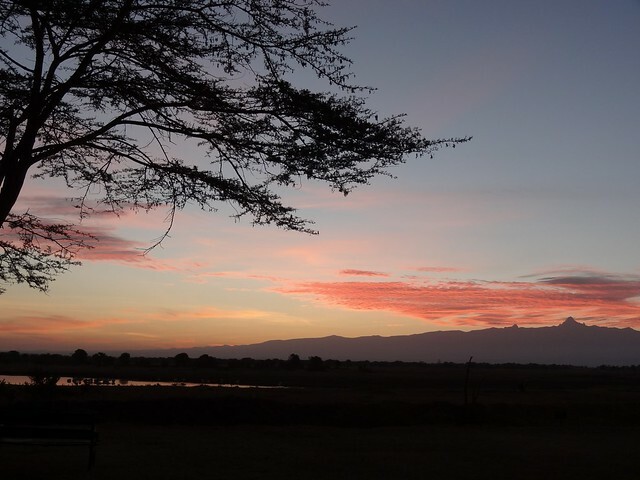 We had a number of safari drives each morning and evening and were lucky enought to see a cheetah hunting an impala. 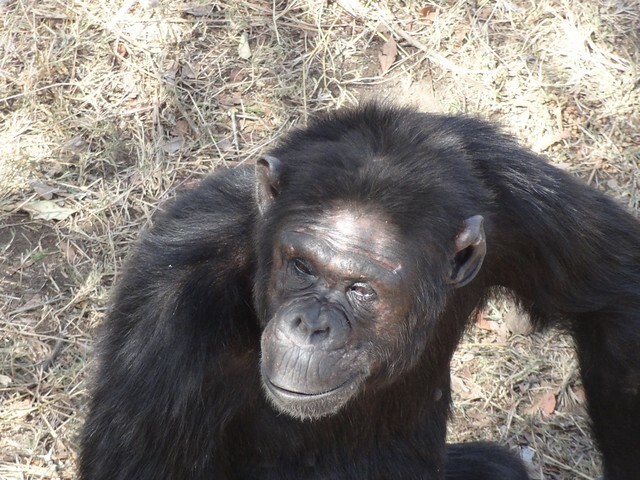 We visited the Chimpanzee rescue park which had over 100 of these expressive animals rescued from across Africa. 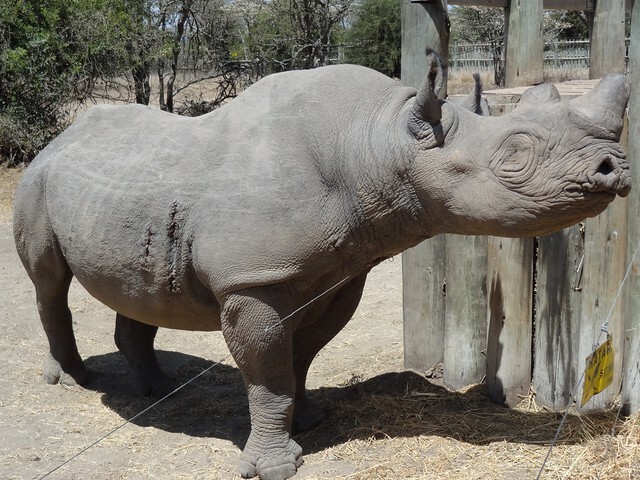 We also got to meet Baraka the blind, black rhino where Abdullah allowed us to feed it some sugar cane. Sweetwaters was a magical experience and highly recommended for anyone requiring some pampering, especially after a hard slog up a mountain. Their hot showers and comfy beds were heavenly and we made the most of them. Sadly all good things have to come to an end and we needed to make our own tracks home so we made it back to Nairobi in about 4 hours without any incident as the election results had all gone smoothly. Peace has thankfully prevailed in this beautiful country.